With the launch of its first Vista class cruise ship in 2016, Carnival continues to massage their image by adding a touch of serious class to their repertoire, while also maintaining its populist (and very popular) approach to cruise vacations. Built in Italy, the Carnival Vista has started its life at sea in Europe, going back and forth between Barcelona and Athens, before it finally settles into its Miami home this fall. In May, our family of four spent 10 days on (and off) the ship during Carnival Vista’s second-ever sailing along that Mediterranean route. Here’s our report on which of Vista’s new features were big hits for parents and kids, and which missed the mark. Tucked into the middle of Vista’s expansive deck 11 sports area, this indoor haven of fun and relaxation features a Ping-Pong table, large soccer-style billiards ‘table’, full bar, comfortable seating area and a large flat-screen TV showing live sports (a Bayern Munich match was on while we played in The Clubhouse for the first time). Racking up mini soccer balls on the oversized billiards table proved one of the many highlights of the cruise for my family. 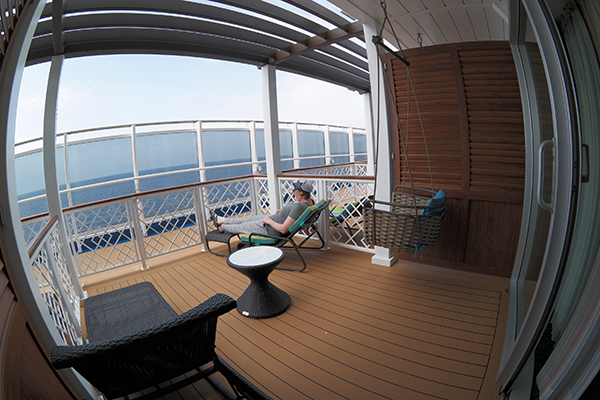 One of Carnival’s goals for Vista is to “better connect passengers to the sea.” The wrap-around 5th deck literally goes a long way to accomplishing this. Whether you’re dining on surf and turf in the upscale Fahrenheit 555 steakhouse for dinner or grabbing a bento box lunch at Bonsai Sushi, you and your family can now choose to dine outside at extremely comfortable and uniquely decorated sofas, seats and tables while enjoying the sea breeze, sunsets, and views for miles. While it isn’t an exclusive feature on Vista, we continue to adore the slices of Quattro Formaggio, Prosciutto and classic cheese (Margherita) thin crust, hand-tossed pizza available all day and night from Pizzeria del Capitano. And we absolutely love its new location on the Vista — the 10th deck in the back of the ship by a swimming pool flanked by two hot tubs and many tables and chairs. Inside the Lido Marketplace (and also in the brand new Family Harbor common area) are all-day and all-night soft serve and fro-yo machines with cones and cups waiting for you and your kids. Yum! During our cruise, fresh local fish was brought on in various ports (Barcelona and Livorno, to name a couple) and served in the new Seafood Shack outpost opposite the pizzeria on deck 10. In a clever foodie twist, guests can visit the Shack to discover the catch of the day, order it to be prepared however they wish (broiled, grilled, etc.) and have it served for dinner at whichever onboard restaurant they are visiting that evening. This is an absolutely brilliant way to soak in the food culture of the cities and regions you are visiting on Carnival Vista. To further the immersion, the main dining rooms offer port-inspired menus at dinner so travelers who demand authentic local food can check that box while cruising. The Athens Greece inspired choices of a Red Mullet fish entr?e, feta croquette, and phyllo dough appetizer were some of the best food we’ve ever eaten. Not even an exclusive feature of a Carnival cruise, but worth mentioning here because Carnival’s food is so tasty, kids are encouraged to spread their culinary wings while cruising as there’s no financial risk to trying new foods. If they don’t like it, send it back for an alternative — no questions asked. Our oldest, a vegetarian, went with a big Indian vegetarian platter comprised of foods she’d never even heard of, let alone tasted, and my youngest, who has issues with some food textures, tried and subsequently devoured the baked apples that came with her pork chop. On Carnival Vista, you can toss the children’s menu aside and encourage your kids to be adventurous with no dent to your wallet like on land! The most glamorous new family activity on board Vista is every bit as remarkable as you’d imagine it to be by looking at the photos. SkyRide puts cruise passengers high above the ship, the sea and the ports thanks to ingenious pedal powered cars. There’s no time limit to complete the 800-foot SkyRide course, no need to race (although you can pedal up to 15 mph! ), is 100 percent free to ride, and has a queue that never got longer than a 30-minute wait (not even on sea days when everyone was on the ship). Carnival Vista’s elevated ropes course has two tracks, one for novices and one offering more of a challenge, but both are thrilling as you traverse tightropes, shaky nets and more exhilarating obstacles at the top of this pristine cruise ship. Even better, this physical challenge is free. The electric rainbow gem of Vista’s WaterWorks is a double-wide, 455-foot long enclosed tube slide that twists and turns gently enough for scaredy-cats like me to enjoy, but enthralling enough for adventure seekers like my oldest daughter to want to keep climbing the steps to ride again and again. One minor issue that may be tweaked as Vista gets its sea legs is that the water pressure isn’t strong enough to always carry younger kids down. My 8-year-old got stuck once and had to push herself to the finish line, and my 12-year-old was sent down once on a mission to dislodge a boy from the middle of the slide. On other Carnival ships, you often find yourself knee to knee with other cruisers while trying to enjoy hot tub time, but not on Carnival Vista. There are more hot tubs than on Sunshine (for example) and that doesn’t even include one oversized Jacuzzi tub in the Serenity spa! On numerous occasions, we had entire hot tubs to ourselves for long stretches of time, adding a dash of family-style serenity to our cruise. All of the free kids’ camps on Carnival Vista are housed in bright, exciting spaces. But Camp Ocean, which is designed for those ages 2 to 11 (then divided up into three age groups inside), is the best of the bunch thanks to a huge arts and crafts space, lots of video game consoles, creative and comfortable seating and enough floor space for many late night kiddie dance parties. 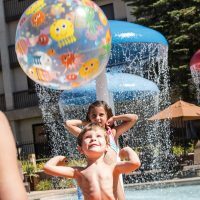 Oh, and the Night Owls program is back, meaning that for a small hourly fee ($6.75 per child plus gratuity), mom and dad can enjoy a date night with a movie under the stars, a fancy sit-down dinner alone, a musical production or a quiet dip in the hot tub. Tucked away like a best kept secret, this free interactive gaming system located on deck 11 just outside the windows of Camp Ocean puts players to the test physically with games that’ll have your entire family moving, dancing, running and coordinating efforts to win. This colorful reading room features a cornucopia of fun seating options and multiple copies of every single Seuss book ever published — and in multiple languages, too! Located beside Camp Ocean, Bookville is free and open to all. The Vista is forever a part of my daughters’ childhoods as Bonsai Sushi is the place they both tried California rolls for the first time! The trendy, moderately-priced eatery serves up some of the tastiest short rib we’ve ever had, incredible Udon noodles and so much more for families who cannot live without delicious freshly-made sushi while away from home. Carnival’s onboard sugar emporium has never been sweeter, with more delicious pre-packaged cookies and candies, a wall of self-serve goodies like gummy worms and chocolate covered everything, and a full-service ice cream sundae bar. Even better, Cherry on Top has outdoor seating to enjoy your goodies in the fresh salt-water air while cruising or in port. Order the Chocolate Buoy sundae and know that a portion of the sale goes to help the kids at St. Jude Children’s Research Hospital! One of the four big stage shows produced in the Liquid Lounge, Flick pays homage to the history of American cinema (The Bodyguard, Rocky, Dirty Dancing to name few) through songs, dancing and mesmerizing hi-tech slight of hand magical elements. Even though they didn’t get all the movie references (and were teased with just a dash of Willy Wonka), our daughters were entranced by the costumes, lights, and sights of this remarkably cool all-ages show. Carnival Vista is the first cruise ship ever to feature IMAX and the results are stunning. Guests will enjoy a truly immersive 3D movie going experience at sea and at a cost similar too (or cheaper than, if you live in a big expensive city like New York or Los Angeles) cinemas on land. In addition to blockbuster movies (“The Jungle Book” and “Batman Vs. Superman” on the first two Carnival Vista sailings) there are IMAX documentaries like “A Beautiful Planet” on screen every day for just $5.50 a ticket. Later in 2016, Vista will be showing movies on the same day they are released in theaters on land! One of the best parts of the cruise for my wife and I was an acoustic musical duo from Liverpool, England, who played outstanding down-tempo covers of Alicia Keys, John Mayer and George Ezra songs with nothing but an acoustic guitar, a box for simple percussion and their two voices. We went to see these guys three nights in a row while the kids were in camp because their vibe was professional, but unpolished, working out the set list on the fly and interacting with each other and the crowds gathered in a natural, unrehearsed way. Me and My Cousin’s refreshingly real musical performances reminded us of being in a cool club or an urban coffee shop. I encountered these cats in the 4th floor elevator lobby one night, randomly, but was stopped in my tracks on my way to somewhere. I sat down on the steps and listened to a few tunes and later caught a whole set with my wife in the 3rd floor atrium bar. Just as with Me and My Cousin, the Scatterhorns offer Carnival Vista guests a genuine live music experience while cruising. Related: Are Short Disney Cruises Worth the Price? 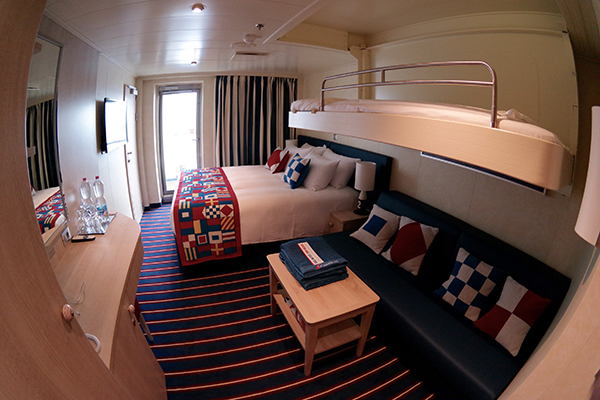 These family-focused deck 2 rooms feature all the same amenities as other cabins, but do so with striking nautical decor. The Family Harbor suites, however, are massive rooms with boatloads of artwork hanging and with space to hang out. While the rooms are a great stylistic addition to the accommodation options on Carnival Vista, it’s the Family Harbor Lounge that truly sets this area apart. Family Harbor guests enjoy this exclusive 24-hour spot with breakfast, snacks during the day and access to concierge services, plus Hasbro board games, family movies, video games and more. Additionally, Family Harbor kids eat free in most specialty restaurants on Vista and receive a free evening of Night Owls in Camp, giving mom and dad a complimentary date night! Exclusive for adults and for families with kids 12 and up, these Cuban-themed suites feature massive 4-star hotel quality bathrooms, a full desk, sitting area and outdoor patio with a lounge chair, seat and ottoman and an amazing swing chair looking out over the sea. Private access to the Havana lounge (until 5 p.m., then it is open to all on board) gives Havana Suite guests an Infinity-style swimming pool and a pair of hot tubs all to themselves. Always a highlight of Carnival cruises for kids and young-at-heart grown-ups alike, the nightly towel animals made by your steward and left as a delightful surprise on your bed once again made coming back ‘home’ after a day and evening of fun on the ship a giddy experience as we guessed which animal we’d see upon pushing open the cabin door. The swimming pools maintain a chillier-than-comfortable temperature, which means only daring Polar Bear club card carrying children will likely be adventurous enough to enjoy these watery retreats. Maybe the warm Miami sun will help heat things up once Carnival Vista relocates to the U.S. in the fall of 2016. As mentioned in the ‘Hits’ section, the Clubhouse is a terrific addition to the sports area on Carnival Vista, but the mini bowling feels out of place because it costs money ($3 per lane, $6 to compete against an opponent in the other lane) for only 5 frames of action, which lasts less than 5 minutes. The mini bowling should be free in the Clubhouse or moved into the arcade (and then extended to a full 10-frame game). My kids will tell you that going to camp is the absolute best thing about a Carnival cruise (Vista included), but once again, the camp dinner offerings are sorely lacking. Instead of bellying up to fresh-made grub in the Lido Marketplace like regular passengers, the camp kids are taken down before Lido officially opens for dinner service, and are fed pre-made quesadillas, lunchmeat sandwiches and other meals that are too-often chewy, cold (when they’re not supposed to be) and dull. For a ship with such outstanding and diverse food choices, it’s a shame to give campers drab dinners. It may not matter at all because your kids may never want to leave camp, but we missed some all-ages nighttime entertainment options, like the popular Dr. Seuss parade and interactive storytime, family-friendly stand-up comedy sets and the larger-than-life Hasbro Family Game Night, found on other Carnival ships.